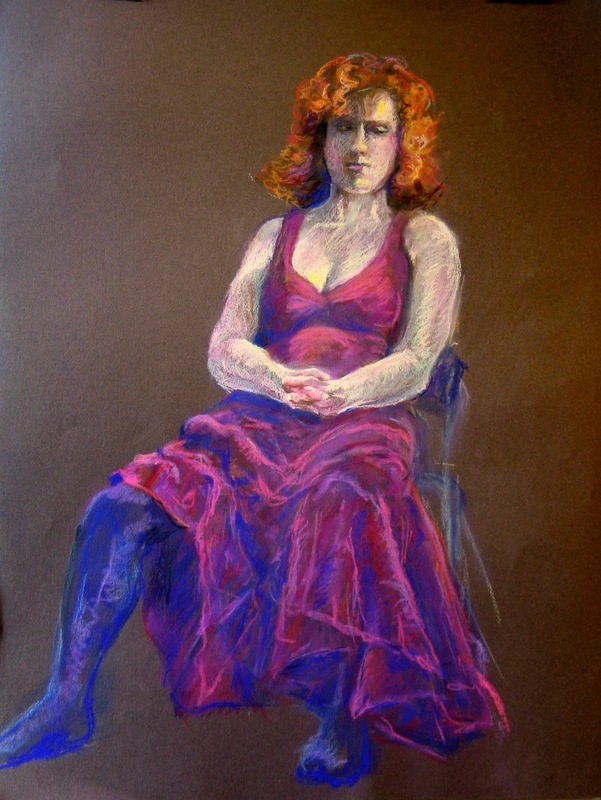 Drawing again this week at Adrienne's- with Gail being our model. We had a small group and all went well. I'd just got some more paper in "tobacco" colour and it seemed the right choice for the red and white outfit Gail wore. 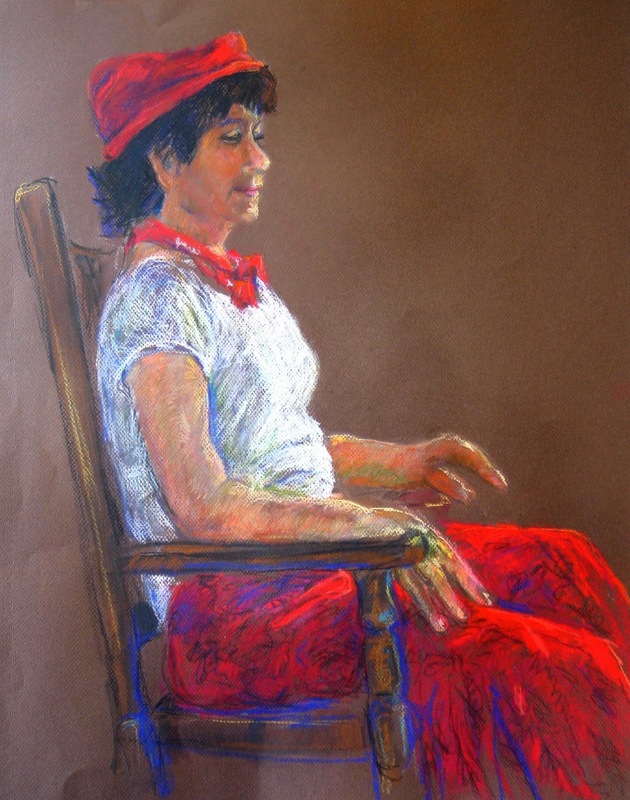 I used some pan pastels for a bit of an underlay- worked mostly in hard pastels but I found a few soft pastels were good for specific colours - especially a rich warm red. 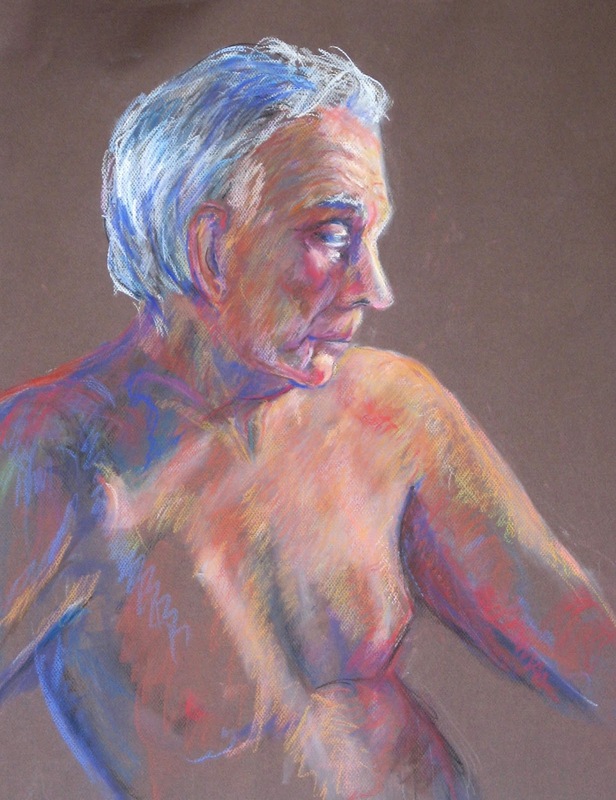 It would be nice to have a big selection of soft pastels - but, then, more to carry around. Mine are rather ancient and down to mostly nubs. However, they don't change in consistency and are as rich in pigment as ever. It was a good session and I'll also post this to my life drawing board on Pinterest. I've been reading "Show Your Work" by Austin Kleon . Yes, same fellow who wrote the book on priming your creativity "Steal Like an Artist". Kleon thinks you should do something **every day** to show your work. Well, that it isn't going to happen but my aim will be to blog at least once a week. We were drawing yesterday at Adrienne's with Bob for a model. I felt he had an interesting character face so I concentrated on mostly the head for the long pose. Again, I am using "wilder" colour - and really enjoying it. Actually the pastels work together nicely and the colours are quite effective. I'm beginning to think I prefer the darker papers to work on-- I think this colour is called "tobacco" so I will have to pick up more of this shade. It is easier to get the edges to stand out when there is a contrast with the background. First, I work on the drawing- placement, proportions and so on. Then I like to block in some lights- figuring out what is the lightest light- and then the shadow areas- and keep on working from there. This is a two-hour pose and I think the timing was right. That is, I had enough time to get as much done as I wanted. The background is just paper colour as there was enough contrast. This was all done in hard pastels with just a bit of pan pastels at the beginning to block in lights and darks. I didn't use pastel pencils at all as I was working large enough that I didn't need them for fine lines. And, I forgot the few soft pastels that I have- so they didn't get used on this one. It was a good drawing session- with the usual variety of styles and media by the different artists - all good, all different! forgotten all those details and I don't remember on what basis I picked cat colours... maybe I painted them pretty well at the same time and had the colours mixed! Definitely these Russian-made blanks are a lot better than the last set I just painted - which won't be shown here until October- and which don't join as nicely. I'm currently painting a bouquet and wishing Spring would hurry along. In the meantime, there are lots of snowdrops out so cheers for them. 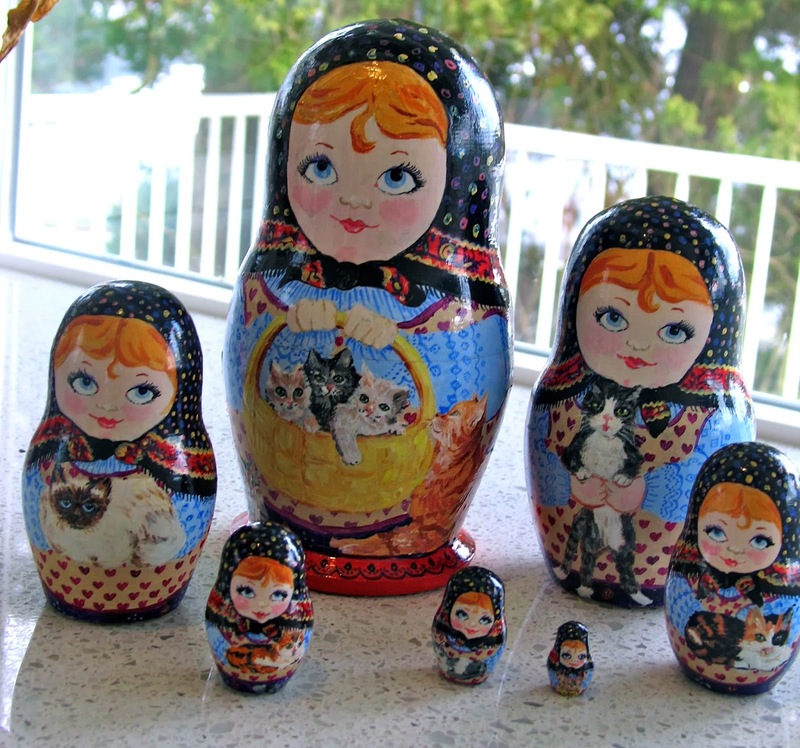 These are my "featured" (in the kitchen window) nesting dolls for March - "Sisters and Cats". I painted them in 1999. They were planned to be quite traditional - all with matching kerchiefs and the only "protrusion" being a slight bump out for the nose of the largest one. They wear matching clothes and all have blond hair with one braid showing and all have a curl in the middle of their foreheads - like the little girl who was "very very good except when she was horrid". These look to be of a very sweet nature but possibly at least with minds of their own. All of them have extra cats going around the backs. These are on Russian blanks and I think the quality is better than the ones from China. All were sanded and gessoed before being painted in acrylics and varnished with acrylic varnish. As usual, I rubbed beeswax along the joins to keep them easy to separate. I have two other Russian blank sets and a couple of the smaller sets from China. The largest one of this set is almost 8 inches in height. I'm thinking of possible new sets to make using the last two Russian blanks to start with- one might be a farm family - with grandparents as the first ones. Another idea is a small shopping centre and the stores- butcher, greengrocer, pharmacist, pet store- not sure of the rest (ideas welcomed!) but probably a nail salon for the last one. 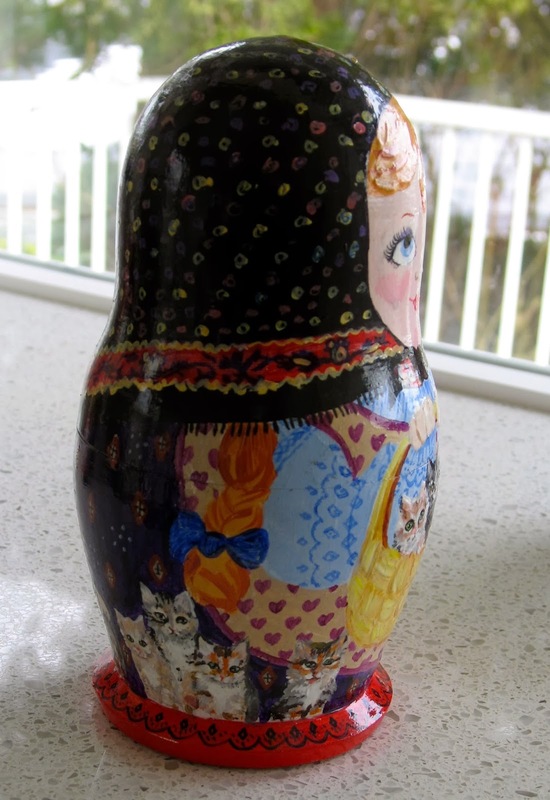 They are a fun way to just let creative ideas flow- and end up as part of my matreshka collection. I see where blanks are available on Etsy and E-Bay but I think prices are up since I got these from Lee Valley. This is a painting that I did a couple of years ago - of the end of Finn Slough. I did exhibit it then- but now I have made a few changes to the colour so this is the one I will take this year for the Art About Finn Slough show. It is going to be on my newsletter but it will only show a section of it- so here is the whole thing. The Fraser River can actually look quite green at times - depends on the light and the weather. I like the challenge of sometimes working on a narrow canvas. I'll post the "March" matreshkas tomorrow.